Now, reading from top to bottom, notice the alternating patterns of 0's and 1's in each place (i.e. one's place, two's place, four's place, eight's place) of the four-bit binary numbers. Note how the least significant bit alternates more rapidly than the most significant bit. Draw a timing diagram showing the respective bits as waveforms, alternating between "low" and "high" states, and comment on the frequency of each of the bits. The purpose of this question is to get students to relate the well-known binary counting sequence to electrical events: in this case, square-wave signals of different frequency. The Q output of the first flip-flop constitutes the least significant bit (LSB), while the second flip-flop's Q output constitutes the most significant bit (MSB). Based on a timing diagram analysis of this circuit, determine whether it counts in an up sequence (00, 01, 10, 11) or a down sequence (00, 11, 10, 01). Then, determine what would have to be altered to make it count in the other direction. This counter circuit counts in the down direction. I'll let you figure out how to alter its direction of count! Actually, the counting sequence may be determined simply by analyzing the flip-flops' actions after the first clock pulse. Writing a whole timing diagram for the count sequence may help some students to understand how the circuit works, but the more insightful students will be able to determine its counting direction without having to draw any timing diagram at all. 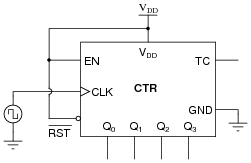 Counter circuits built by cascading the output of one flip-flop to the clock input of the next flip-flop are generally referred to as ripple counters. Explain why this is so. What happens in such a circuit that earns it the label of "ripple"? Is this effect potentially troublesome in circuit operation, or is it something of little or no consequence? When these counters increment or decrement, they do so in such a way that the respective output bits change state in rapid sequence ("rippling") rather than all at the same time. This creates false count outputs for very brief moments of time. Whether or not this constitutes a problem in a digital circuit depends on the circuit's tolerance of false counts. In many circuits, there are ways to avoid this problem without resorting to a re-design of the counter. If your students have studied binary adder circuits, they should recognize the term "ripple" in a slightly different context. Different circuit, same problem. Challenge question: to really understand this type of counter circuit well, include propagation delays in your timing diagram. However, even with propagation delays included (equal delays for each flip-flop), you should find there is still no "ripple" effect in the output count. "Walk" through the timing diagram given in the answer, and have students explain how the logic states correspond to a two-bit binary counting sequence. A student just learned how a two-bit synchronous binary counter works, and he is excited about building his own. He does so, and the circuit works perfectly. Unfortunately, this circuit didn't work. The sequence it generates is not a binary count. Determine what the counting sequence of this circuit is, and then try to figure out what modifications would be required to make it count in a proper binary sequence. I like to introduce students to synchronous counter circuitry by first having them examine a circuit that doesn't work. After seeing a two-bit synchronous counter circuit, it makes intuitive sense to most people that the same cascaded flip-flop strategy should work for synchronous counters with more bits, but it doesn't. When students understand why the simple scheme doesn't work, they are prepared to understand why the correct scheme does. Discuss with your students how to relate timing diagrams to binary counts (as shown in the answer). Explain why this circuit is able to function properly (counting in either direction), while the first circuit is not able to count properly at all. What do those ëxtra" gates do to make the counter circuit function as it should. Hint: to more easily compare the up/down counter to the faulty up counter initially shown, connect the Up/[`Down] control line high, and then disregard any lines and gates that become disabled as a result. The ëxtra" AND gates allow higher-level bits to toggle if and only if all preceding bits are high. Although the up/down counter circuit may look overwhelmingly complex at first, it is actually quite simple once students recognize the intent of the AND and OR gates: to ßelect" either the Q or [`Q] signal to control subsequent flip-flops. 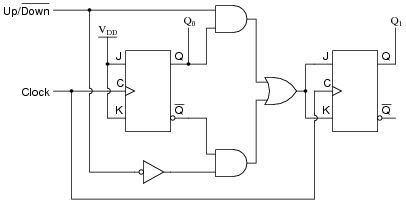 Explain what would happen if the upper AND gate's output were to become ßtuck" in the high state regardless of its input conditions. What effect would this kind of failure have on the counter's operation? The counter would not be able to count in the üp" direction. When commanded to count that direction, the LSB would toggle between 0 and 1, but the MSB would not change state. The purpose of this question is to get students to understand how a synchronous up/down counter works, in the context of analyzing the effects of a component failure. With the asynchronous lines paralleled as such, what are we able to make the counter do now that we weren't before we had asynchronous inputs available to us? Now, we are able to force the counter to zero (0000) or full count (1111) at will. Ask your students why this feature might be useful. Can they think of any applications involving a counter circuit where it would be practical to force its output to either zero or full count regardless of the clock's action? Research the function of this integrated circuit, from manufacturers' datasheets, and explain the function of each input and output terminal. Follow-up question: both the reset ([`MR]) and preset ([`SPE]) inputs are synchronous for this particular counter circuit. 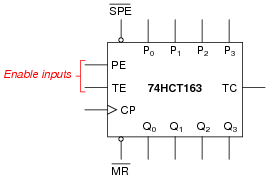 Explain the significance of this fact in regard to how we use this IC. Ultimately, your students will most likely be working with pre-packaged counters more often than counters made up of individual flip-flops. Thus, they need to understand the nomenclature of counters, their common pin functions, etc. If possible, allow for the group presentation of datasheets by having a computer projector available, so students may show the datasheets they've downloaded from the internet to the rest of the class. Something your students may notice when researching datasheets is how different manufacturers give the same IC pins different names. This may make the interpretation of inputs and outputs on the given symbol more difficult, if the particular datasheet researched by the student does not use the same labels as I do! This is a great illustration of datasheet variability, covered in a way that students are not likely to forget. Follow-up question: if used as a frequency divider, what is the input:output ratio of this circuit? How difficult would it be to design a Johnson counter with a different division ratio? Discuss with your students how Johnson counters are quite different from binary-sequence counters, and how this uniqueness allows certain counting functions to be implemented much easier (using fewer gates) than other types of counter circuits. 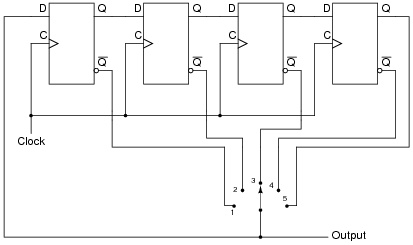 Describe the output of this circuit, as measured from the Q output of the far right flip-flop, assuming that all flip-flops power up in the reset condition. 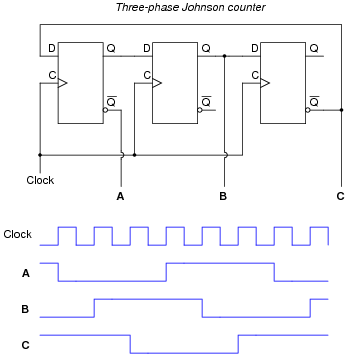 Johnson counters provide a divide-by-n frequency reduction. 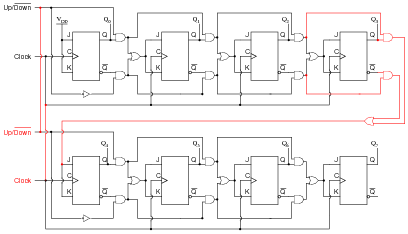 The second counter circuit shown has the ability to select different values for n.
Strictly speaking, this circuit is a divide-by-2n counter, because the frequency division ratio is equal to twice the number of flip-flops. The final (#5) switch position is interesting, and should be discussed among you and your students. After deciding how to cascade these counters, imagine that you are in charge of building and packaging four-bit counter circuits. The customers who buy your counters might wish to cascade them as you did here, but they won't have the ability to "go inside" the packaging as you did to connect to any of the lines between the various flip-flops. This means you will have to provide any necessary cascading lines as inputs and outputs on your pre-packaged counters. Think carefully about how you would choose to build and package your four-bit "cascadable" counters, and then draw a schematic diagram. This first solution requires some elimination of wires and one gate from the front end of the second counter . . . I'll let you decide how you might wish to package your four-bit counter circuits, so as to allow easy cascading. This will be an excellent topic for classroom discussion! 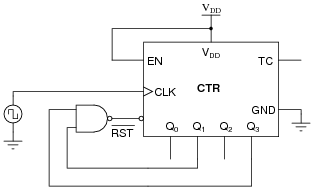 Follow-up question: why isn't the following circuit an acceptable solution? Figuring out how to cascade the two four-bit counters is the easy part. The challenge is to "think ahead" in designing a four-bit counter with all the necessary connections to make cascading easy for the end-user. Make this the center of discussion on this particular question. Explain how this counter circuit works, and also determine which output bit is the LSB and which is the MSB. Explain how this counter circuit works, and how its operation differs from the previous eight-bit counter circuit. 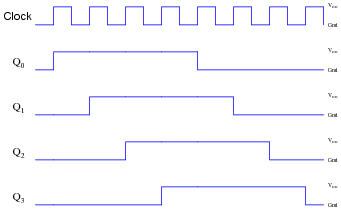 The first circuit shows two four-bit counters cascaded together in a ripple fashion. 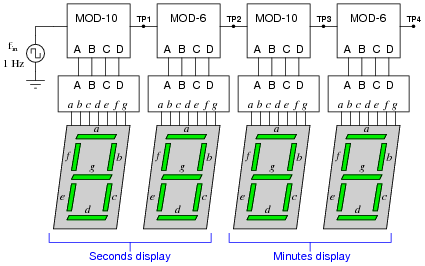 The second circuit shows the same two four-bit counters cascaded in a synchronous fashion. In both cases, Q0 of the left counter is the LSB and Q3 of the right counter is the MSB. Follow-up question: comment on which method of cascading is preferred for this type of counter IC. Is the functional difference between the two circuits significant enough to warrant concern? 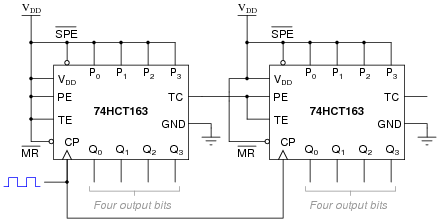 It is important for students to consult the datasheet for the 74HCT163 counter circuit in order to fully understand what is going on in these two cascaded counter circuits. Unfortunately, this arrangement does not work so well. It seems to work good for the first 241 counts (from 000000000000 to 000011110000), but then the last four bits begin to cycle as quickly as the first four bits, while the middle four bits remain in the 1111 state for 15 additional clock pulses. Something is definitely very wrong here! Determine what the problem is, and suggest a remedy for it. Hint: this situation is very similar to connecting more than two J-K flip-flops together to form a synchronous counter circuit. The "fix" for this problem is to enable the last (most significant) four-bit counter only when the terminal count (TC) outputs of both preceding counter circuits are active. I will let you figure out the details of this solution for yourself. The "hint" in this question may give away too much, as the problem is precisely identical to the problem encountered with overly simplistic synchronous J-K flip-flop cascades. What new students tend to overlook is the necessity to enable successive stages only when all preceding stages are at their terminal counts. When you only have two stages (two J-K flip-flops or two IC counters) to deal with, there is only one TC output to be concerned with, and the problem never reveals itself. Be sure to give your students time and opportunity to present their solutions to this dilemma. Ask them how they arrived at their solutions, whether by textbook, prior example (with J-K flip-flops), or perhaps sheer brain power. In this case, as in others, the two enable inputs are not identical. Although both must be active for the counter to count, one of the enable inputs does something extra that the other one does not. This additional function is often referred to as a look-ahead carry, provided to simplify cascading of counters. Explain what "look-ahead carry" means in the context of digital counter circuits, and why it is a useful feature. The important lesson in this question is that synchronous counter circuits with more than two stages need to be configured in such a way that all higher-order stages are disabled with the terminal count of the lowest-order stage is inactive. 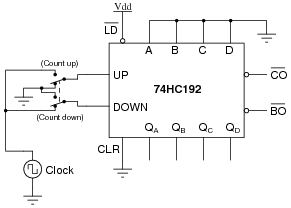 This ensures a proper binary count sequence throughout the overall counter circuit's range. Your students should have been introduced to this concept when studying synchronous counter circuits made of individual J-K flip-flops, and it is the same concept here. Also important here is the realization that some IC counters come equipped with the "look-ahead" feature built in, and students need to know how and why to use this feature. Determine the modulus (MOD) of a four-bit binary counter. Determine the modulus of two four-bit binary counters cascaded to make an eight-bit binary counter. Four bit counter modulus = 16. Eight bit counter modulus = 256. Follow-up question: is it possible for a four-bit counter to have a modulus equal to some value other than 16? Give an example! The real purpose of this question is to get students to find out what term "modulus" means, and how it relates to counter bits. Also, show how you would modify this circuit to do the same count sequence (BCD) assuming the IC has a synchronous reset function, meaning the counter resets to 0000 if [`RST] is low and the clock input sees a pulse. 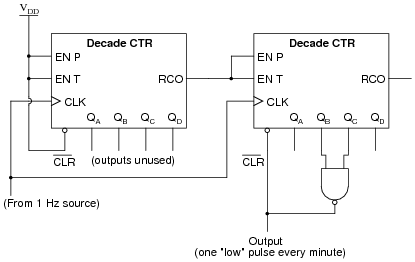 Although both circuits achieve a BCD count sequence, the synchronous-reset circuit is preferred because it completely avoids spurious ("ripple-like") false outputs when recycling. Be sure to emphasize that the difference between an asynchronous and a synchronous reset function is internal to the IC, and not something the user (you) can change. 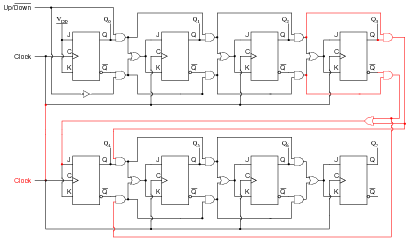 For an example of two otherwise identical counters with different reset functions, compare the 74HCT161 (asynchronous) and 74HCT163 (synchronous) four-bit binary counters. Suppose you had an astable multivibrator circuit that output a very precise 1 Hz square-wave signal, but you had an application which requires a pulse once every minute rather than once every second. Knowing that there are 60 seconds in a minute, can you think of a way to use digital counters to act as a "frequency divider" so that every 60 multivibrator pulses equates to 1 output pulse? Note: assume these counter ICs have asynchronous resets. Follow-up question: why can't we take the divide-by-60 pulse from the RCO output of the second counter, as we could with the divide-by-10 pulse from the first counter? Challenge question: re-design this circuit so that the output is a square wave with a duty cycle of 50% ("high" for 30 seconds, then "low" for 30 seconds), rather than a narrow pulse every 60 seconds. Tell your students that counter circuits are quite often used as frequency dividers. Discuss the challenge question with them, letting them propose and discuss multiple solutions to the problem. The "note" in the question about the asynchronous nature of the counter reset inputs is very important, as synchronous-reset counter ICs would not behave the same. Discuss this with your students, showing them how counters with synchronous reset inputs would yield a divide-by-61 ratio. Incidentally, a divide-by-60 counter circuit is precisely what we would need to arrive at a 1 Hz pulse waveform from a 60 Hz powerline frequency signal, which is a neat "trick" for obtaining a low-speed clock of relatively good accuracy without requiring a crystal-controlled local oscillator. (Where the "mains" power is 50 Hz instead of 60 Hz, you would need a divide-by-50 counter - I know, I know . . .) If time permits, ask your students to think of how they could condition the 60Hz sine-wave (120 volt!) 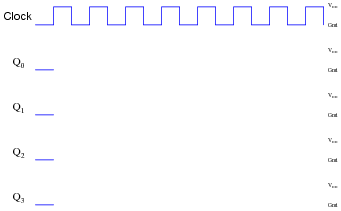 standard powerline voltage into a 60 Hz square-wave pulse suitable for input into such a frequency divider/counter circuit. Follow-up question: if the clock frequency for this divider circuit is exactly 1.5 kHz, is it possible for the divided frequencies to vary from what is predicted by the modulus values (150 Hz, 25 Hz, 12.5 Hz, and 2.5 Hz)? Explain why or why not. The purpose of this question is to introduce students to the schematic convention of counter/dividers as simple boxes with "MOD" specified for each one, and to provide a bit of quantitative analysis (albeit very simple). A student builds a four-bit asynchronous counter circuit using CMOS J-K flip-flops. It seems to work . . . most of the time. Every once in a while, the count suddenly and mysteriously "jumps" out of sequence, to a value that is completely wrong. Even stranger than this is the fact that it seems to happen every time the student waves their hand next to the circuit. What do you suspect the problem to be? This is a mistake I see students making all the time. The fact that the circuit is built with CMOS components, and fails whenever an object comes near it, is a strong hint that the problem is related to stray static electric charges. It is an easily corrected problem, caused by the student not taking time to connect all the pins of their flip-flops properly. I didn't exactly reveal the source of trouble in the answer, but I gave enough hints that anyone familiar with CMOS should be able to tell what it is! This truly is a problem I've seen many times with my students! Explain why your proposed fault would cause the problem. Two possibilities are immediately apparent: inverter U5 has a failed-low output, or flip-flop U1 has a failed-low [`Q] output. Discuss the merit of all faults proposed in answer to this question with your students. Ask them to explain the reasoning behind their answers, and use this as an opportunity to correct conceptual errors about the operation of this circuit. Although the counting sequence is proper, the circuit usually does not begin counting from 0000 at power-up. The fact that the circuit counts correctly suggests that there is nothing failed or mis-wired, so what could possibly be wrong? The flip-flops' initial states at power-up are essentially random because they are subject to internal race conditions between the constituent gates. What is needed is some form of automatic reset to force all flip-flops to the reset state at power-up. This is a very practical issue for state-machine circuits: making sure the circuit begins in the desired state rather than in some random condition. Resistor R1 fails open: Counter may not reset at power-up. Resistor R2 fails open: Counter will not count, output stuck at 0000. Resistor R3 fails open: Counter will not count, output stuck at 0000. Capacitor C1 fails shorted: Counter will not count, output stuck at 0000. Follow-up question: suggest some reasonable values for the three resistors and the capacitor. 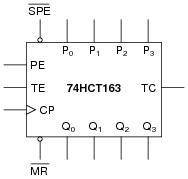 Determine what the student is doing wrong with this 74HC192, and then correct the schematic diagram. Did you think I was just going to give the answer away here? Consult a datasheet for the 74HC192 to see for yourself! The point of this question is to have students research a datasheet to figure out the necessary conditions for making a digital IC perform as it should. This is extremely important for students to get into the habit of doing, as it will save them much trouble as technicians! The technician was trying to troubleshoot this circuit, but left without finishing the job. You were sent to finish the work, having only been told that the timer circuit "has some sort of problem." Your first step is to start the 1 Hz clock and watch the timing sequence, and after a few minutes of time you fail to notice anything out of the ordinary. Now, you could sit there for a whole hour and watch the count sequence, but that might take a long time before anything unusual appears for you to see. Devise a test procedure that will allow you to pinpoint problems at a much faster rate. Disconnect the 1 Hz clock pulse generator and re-connect the counter input to a square-wave signal generator of variable frequency. This will speed up the counting sequence and allow you to see what the problem is much faster! Follow-up question: suppose you did this and found no problem at all. What would you suspect next as a possible source of trouble that could cause the timer circuit to time incorrectly? Connecting a faulty circuit to a different input signal than what it normally runs at is an excellent way to explore faults. However, it should be noted that some faults may go undetected using this technique, because you have altered the circuit in the process. Explain the difference between a synchronous counter and an asynchronous counter circuit. A ßynchronous" counter circuit's flip-flops are clocked simultaneously, while each of the äsynchronous" counter circuit's flip-flops is clocked by the output of the preceding flip-flop. Ask your students to discuss what advantages, if any, one of these counter circuit types may have over the other. 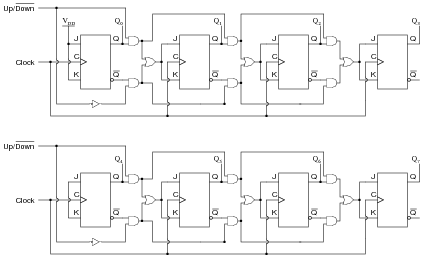 Draw the schematic diagram for a four-bit binary üp" counter circuit, using J-K flip-flops. The circuit shown here is not the only valid solution! Follow-up question: what other configuration of J-K flip-flops could be used to make a four bit binary üp" counter? Be sure to discuss the follow-up question with your students. It is important that they understand how to make both üp" and "down" counters using J-K flip-flops, and that there are two basic methods to make each direction of counter. This is a synchronous üp" counter. This is an asynchronous üp" counter. This is an asynchronous "down" counter. Follow-up question: if the clock frequency for this divider circuit is exactly 25 kHz, is it possible for the divided frequencies to vary from what is predicted by the modulus values (5 kHz, 625 Hz, 312.5 Hz, and 31.25 Hz)? Explain why or why not.